It sometimes surprises our visitors to learn that Special Collections is home not just to books and papers, but to objects as well. Objects, just like books, can tell important stories—stories about their creators, stories about their owners, stories about the world in which they were made and used—and we can learn from objects in much the same way that we can learn from textual documents. Take, for example, our collection of Chinese snuff bottles...which is both visually stunning as well as utilitarian in nature, as these bottles were originally meant for daily use. Thus, in one collection we simultaneously learn about popular customs and class distinctions as well as about the artistic methods employed in China during the seventeenth and eighteenth centuries. One particularly fascinating set of objects proudly housed in Special Collections is the Dr. and Mrs. Bernard H. Kessner Collection of Doughty Birds. This collection consists of seven hand-crafted bone china sculptures of birds (and one bee!) designed (and signed) by famed British sculptor and potter Dorothy Susan Doughty (1892-1962). Doughty, known mainly for her American bird models, also designed models based on English birdlife during the second half of her life. The seven porcelain sculptures were fired at the Royal Worcester Ceramic Works in Stoke-on-Trent, England, a city famed since the 17th century for its industrial-scale pottery manufacturing. Royal Worcester is one of the oldest remaining English porcelain brands in existence today and has been granted Royal Warrants three times since its founding in 1751. Donated in 1972 by Dr. and Mrs. Bernard H. Kessner, the sculptures are: Female Yellow-headed Blackbird and Spiderwort, Male Yellow-headed Blackbird and Spiderwort, Bee in Apple Blossom, Female Yellowthroat and Water Hyacinth, Male Yellowthroat and Water Hyacinth, Female Scarlet Tanager and White Oak Spray, and Male Scarlet Tanager and White Oak Spray. Whimsical, natural, beautiful, delicate, and strong, Doughty’s sculptures were clearly meant to be viewed from several angles – each angle providing the viewer with a different perspective of the bird in its natural habitat. Doughty posed her birds in an array of emotive attitudes and always depicted both the male and female of species. Upon close inspection, the viewer is able to see the lifelike expressions on the birds’ faces, to notice the distinction between their individual markings, and to find the hidden details. It can be easy to lose yourself in the tiny world surrounding each bird, similar to the way you might lose yourself in the glory of a birdwatching excursion. The Kessner Collection is not the only gateway to nature visitors will find in Special Collections, and in fact, it nicely complements two other collections held in this department. One of these collections is a set of spectacular wildlife photographs taken by famed naturalist, avid photographer, and editor of the Peterson field guides, Roger Tory Peterson. Special Collections is also home to naturalist and painter John James Audubon’s stunning set of life-sized, hand-coloured prints entitled Birds of America (these are bound in a four-volume set of double-elephant folios, each as large as one of our Reading Room tables!). Doughty, Peterson, and Audubon each portrayed the birdlife of America, not in isolation, but in the context of its natural habitat. All three artists portray their winged subjects surrounded by the flora and fauna among which they existed—some perched near shrubs, some standing half in the water, some with bees buzzing nearby. 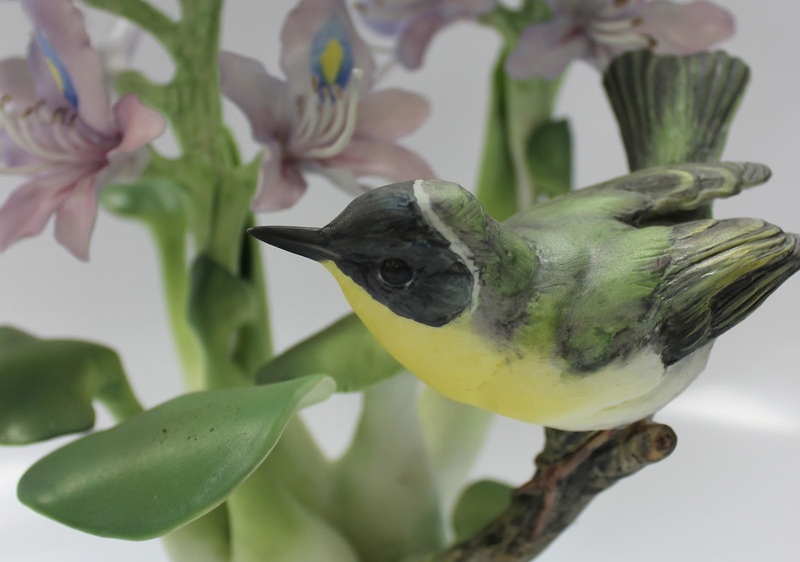 The Doughty bird sculptures, like Peterson’s and Audubon’s works, do more than merely depict American birdlife. They are pieces of art, pleasing to the eye as well as to the mind. They should prove interesting to art historians, botanists, ornithologists, and amateur birders alike, and all three serve as primary source examples for the study of art, birds, and plant-life in America over the past 200 years. Description by Chloe Morse-Harding, Reference Archivist and Surella Evanor Seelig, Archives & Special Collections Outreach Librarian.